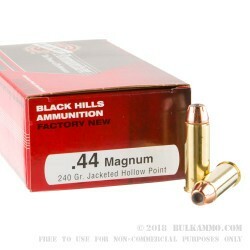 A premium .44 Magnum ammunition that offers great stopping power and excellent build quality. The Black Hills brand name has been synonymous with high quality since their debut on the market. Their commitment to quality and consistency as well as their history of providing contract supplies of ammunition to military and law enforcement makes them a fine choice for your .44 Magnum needs. 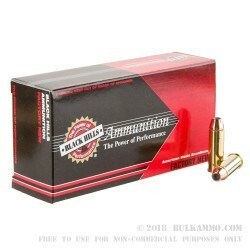 This is a 240 grain jacketed hollow point with a high quality component set and is made for personal protection and self-defense or for hunting purposes. The Black Hills load is a nice mix of large projectile and ballistic performance, with the large 240 grain bullet and the 1260 feet per second velocity and 845 ft. lbs. of energy. These numbers are good enough to make this a legitimate large game hunting round and a potent self defense round; the added bonus of having premium components makes this a premium ammo option. The excellent powder is cleaner than most .44 Magnum powders and the Boxer primer in the brass casing offers easy reloadability after the first time the rounds are used. 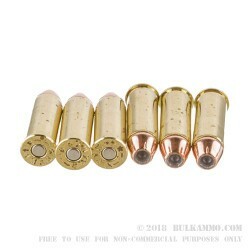 This ammunition can be used in lever action, single shots, automatics (like the Desert Eagle) and revolvers, with no difficulty. The exceptional build quality makes it an easy to love round, despite fairly heavy recoil for the load.